Published by Silvana Editoriale, the official catalogue of GAME VIDEO/ART. A SURVEY will be introduced by a panel comprising Andrea Cancellato, (Triennale CEO), Prof. Mario Negri (Rector), Prof. Gianni Canova (Pro Rector), and Matteo Bittanti (co-curator). The book was edited by Matteo Bittanti and Vincenzo Trione and features contributions by Claudio De Albertis, Mario Negri, Vincenzo Trione, Vanni Codeluppi, Anna Luigia De Simone, Stefano Bartezzaghi, Isabelle Arvers, Henry Lowood, and Matteo Bittanti. In addition, the catalogue includes quotes from the artists' interviews produced by the Master's Degree students in Arts, Cultural Heritage, and Markets at IULM. The presentation will be followed by a performance by artist Marco Mendeni (Sala dei 146, IULM 6) entitled r lightTweakSunlight01. Pubblicato da Silvana Editoriale, il catalogo ufficiale di GAME VIDEO/ART. A SURVEY sarà introdotto da un panel formato da Andrea Cancellato (Direttore Generale, Triennale Milano), il Rettore Mario Negri, il Prof. Gianni Canova e Matteo Bittanti. Curato da Matteo Bittanti e Vincenzo Trione, il volume include contributi di Claudio De Albertis, Mario Negri, Vincenzo Trione, Vanni Codeluppi, Anna Luigia De Simone, Stefano Bartezzaghi, Isabelle Arvers, Henry Lowood, Matteo Bittanti, nonché citazioni tratte dalle interviste agli artisti realizzate dagli studenti della Laurea Magistrale in Arte, Patrimoni e Mercati della IULM. La presentazione sarà seguita da una performance dell'artista Marco Mendeni intitolata r lightTweakSunlight01 della durata di circa 30 minuti, sempre in Sala dei 146. 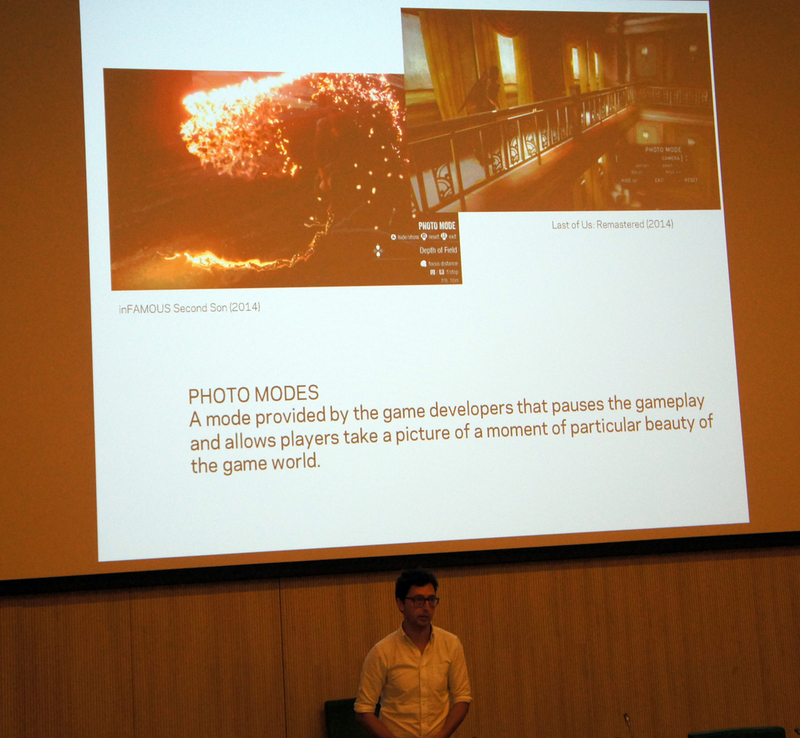 ON MAY 6 2016, SPANISH ARTIST ROC HERMS VISITED IULM TO DISCUSS HIS PHOTOGRAPHIC PRACTICES IN VIDEO GAMES AND VIRTUAL WORLDS HERE IS THE EDITED VIDEO OF HIS LECTURE. The video was produced by IULM Communication. Editing by Matteo Bittanti. Below is Roc Herm's Study of perspective, a re-enactment of Ai Weiwei's project of the same title within Grand Theft Auto V. Read more on VICE magazine. Roc Herms (Spain, 1978) has been taking photographs since 2002. Herms explores the increasing digitalization of the human race and the ongoing relationship between the self and its mediated expressions. In 2008, he won the Editor's Award for Excellence awarded by PHOTO ICON Magazine. Herms’ series Are You Sure You Want To Log Out? was exhibited at the 2014 Noorderlicht Photography Festival: An Ocean of Possibilities. Herms is the author of several books, including Postcards from Home and <Yo> <Yo> <Yo> <Yo> (2007-2015). 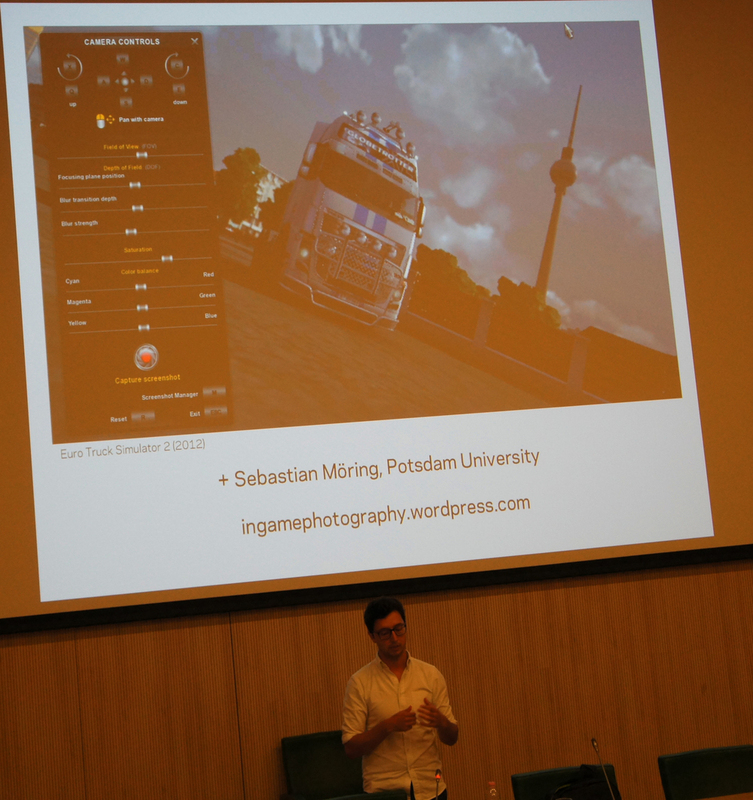 His most recent work is currently on display at fotomuseum in Winterthur, Switzerland, as part of the ongoing series SITUATIONS_PLAY. 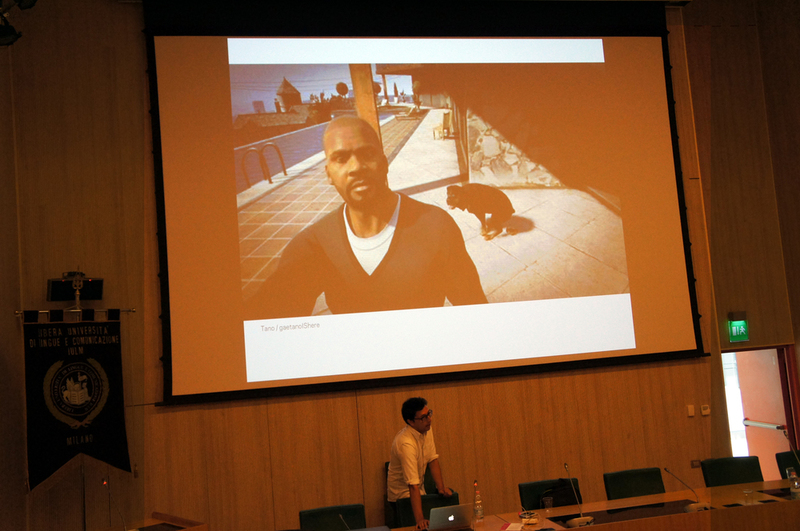 On May 5 2016, Mexican artist Oscar Nodal visited IULM Milan to discuss the role of glitches in his machinima practice. HERE IS THE EDITED video of his lecture. Nodal's Sleepy Existence (2014) is currently on display in the RECORD section of GAME VIDEO/ART. A SURVEY. Documentation of a Hacked Nintendo Entertainment System with an Arduino board, Mix with images of gitlches from Super Mario Bros. 3 Glitches are both software and harware.